Hey Phat Chick! Video Premiere, Unity Concert, goin' outta tahn w/ Kabarett and Ka-Blam! I gave you incorrect info in my last email/post! I said I had a Video Premiere tonight at Blue Moon, Sat April 18.... AND IT WAS ALL LIES AND PROPAGANDA! It's TOMORROW! So, here is a list of some incredible events I am part of this week and next, I hope you can come, and my show schedule is popping, so check my reverbnation profile for the most up to date info about my appearances! 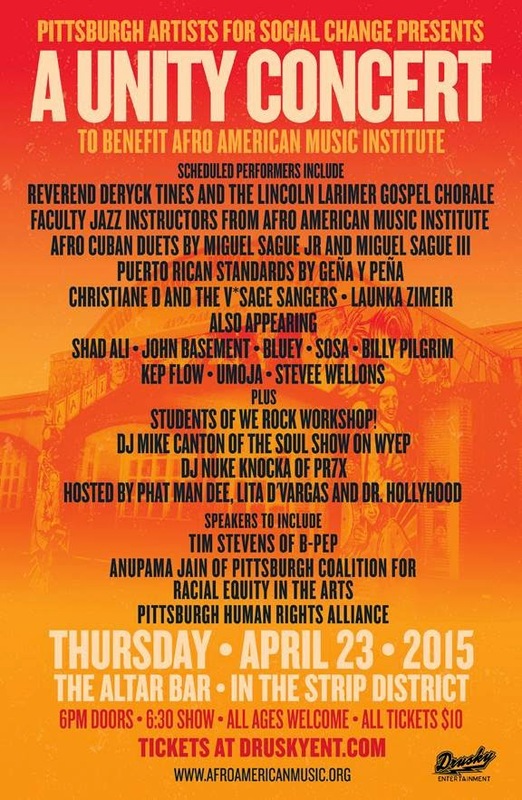 Unity Concert, a fundraiser for the Afro American Music Institute! Artists, activists and promoters in the Pittsburgh community have come together to present a concert to be a small part of helping to foster unity through music and art. This concert series shall benefit AAMI with 100% of all proceeds from the door, and in addition to donating 100 % of ticket sales, Drusky Entertainment shall contribute a portion from each and every ticket sold at all future Drusky Entertainment concerts at Altar Bar for the period of one year the beneficiary. Pittsburgh Artists for Social Change is proud to associate with Drusky Entertainment in their mission to demonstrate in a real and meaningful way how much we all support and appreciate the work of both of these worthy groups. I am hitting the road to go to Johnstown, PA for the Young Professionals of the Alleghenies Vegas Night and Fundraiser! We will be performing at the dinner and entertainment early evening event at ArtSpace! It's almost sold out, only 15 tickets left, so if you want one, now is the time! I return back to Pittsburgh for Ka-Blam! a fundraiser for the Toonseum at the Teamsters Temple Banquet Hall in Lawrenceville. VIP reception scheduled beforehand from 7pm to 8pm. VIP tickets are $75 each or $125 per couple, while regular admittance is $40. Rick Sebak is hosting, J Malls is spinning, Pittsburgh Dad's gonna be running around up in there somewheres and I hope to see you there!!!! I am thrilled to state I shall be emceeing the opening night festivities of the International Queer Burlesque Festival, right here in Pittsburgh, PA! Join us downstairs in the showbar of Cattivo for the Fierce: International Queer Burlesque Festival fancy Friday Showcase. The headliner is the luscious Ms. GiGi LaFemme from Nashville, TN - joined by our evening Feature, the equally delicious Ms. Nina La Voix from NYC Presale tickets $10 bucks or $15 bucks at the door!